You do a research to make sure you are entrusting your car to a reputable Australian car transport company. Identify the signs that a company is not good for you to avoid damaging not only your car but also your pocket. Take note of any unbalanced quote compared to other transport companies. Cheap transport service doesn’t mean spending less since the quality of service could also be low. This does not mean you’d get confident in getting the expensive ones. Learn to compare the different rates the companies offer. While most car shipping companies require deposits before delivering your car, be vigilant in companies asking for large deposits as you may be scammed or get unsatisfactory service. You should be extra careful since questionable car shipping companies have a low quality of service. Look for their reviews and see the feedback from their clients. Keep in mind that you are in for a car transport that would take care of your car as their own. Don’t settle for anything less. Some Australian car transport makes a lot of promises to their clients but can’t keep it. Keep in mind that the promises they have for you are realistic. Some prospective clients are deceived by salespeople selling their service without any follow-through. This is basic. Not being able to show any legal document puts the company I. Question if they are legit. There is still a possibility that the documents they have are fake, so do your research as papers can easily be manipulated. Do a thorough background check to ensure your car’s safety. This is a telltale sign of a disaster. Some auto transport companies will introduce you to their contract with too little time to read it, let alone understand what’s in it. Remember that the Bill of Lading is a documented contract that protects your cargo and taking your time to read and understand it is important. It will be your claim, your assurance should any dispute in the future arise. You might have some questions about the contract, and there would be no time to answer them when it is presented pronto at the time of the pickup. Don’t trust the companies offering instant estimates online. There could be extra fees like the door-to-door services, terminal fees, or the insurance coverage. Instead, ask for a customised quote for your particular situation. Every legit and trusted car transport company should have an easy system that allows you to such request. Spend some time asking about the system rather than relying on the instant quotes online. How can you expect an Australian car transport to be reliable when they don’t even put an extra effort in taking care of their website? Keeping a decent website should be a clue as to how they would put an effort into running their business well and putting a good image to their clients and potential ones. Their website should offer a clear explanation of the process. They should also be objective in informing the clients about the process. 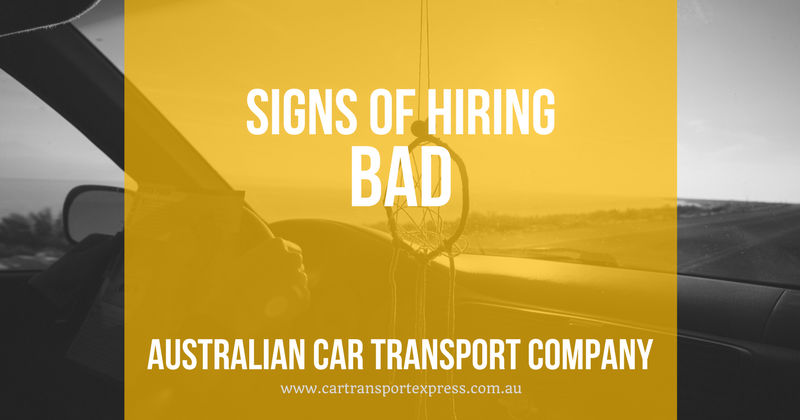 Whether the company you hired is reputable or not, you should be prepared for the possible problems that you might encounter upon the car transfer. A company can present itself however they want, but it is a good reflection of how they view quality in putting up their image and taking care of their clients.